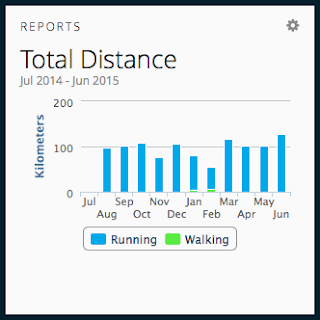 I love a good statistic and with a number of apps talking to my Garmin I'm not short of data to geek-out to. Strava, Runkeeper, Fitbit and Garmin itself all spew out some great stats so here are a few choice from the last week (Monday to Sunday). Longest run - 21.1km - that'll be a half marathon right there! Shortest run - 3.8km. Probably should have rested the day after that HM but the OCD part of my brain wanted to see my distance tip over the marathon distance. Think I'm paying for it today! Fastest pace - Tuesday's 5km was a 5:40 per km pace. That'll do for the heat an humidity of this week. And looking in a broader sense - June has been the month where I've run the most km in total - a total of 128.6km. Juneathon update - Definitely in need of a rest day, but that didn't stop me walking the whole of the million miles around Ikea this evening after a full day on my feet at work! Reckon that suffice for today. Indeed I am also amazed by your amazing stats and maybe you will do even more in coming days as well. Love your hard work and incredible strength in running. For the long run - long run checklist. 10 Ways You Know You're A Runner. Juneathon - Getting Active in June!